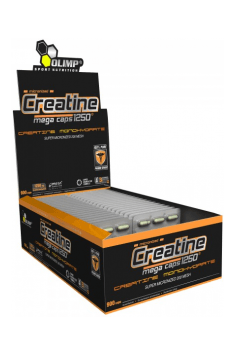 Olimp Creatine Mega Caps is a preparation containing micronised creatine monohydrate in capsules with a high dose of the active substance. The main advantages of the product are its affordable price and quick results, which make it one of the best choices available in terms of basic supplements for physically active people. Creatine monohydrate is the most commonly used form of the compound in which the addition of a water molecule increases the stability of the entire molecule. Creatine is a compound found naturally in the human organism, mainly in the skeletal muscles. The muscle tissue is unable to synthesise creatine on its own, so the compound has to be synthesised elsewhere or delivered with food. It is worth mentioning that the demand for creatine in physically active people is significantly higher than the amount that can be produced by the body or delivered through food. Both limitations are the reason why creatine was introduced as a supplement for physically active people to make their diet complete. Creatine synthesis in the human body is possible in the presence of arginine, glycine, and a potent methyl donor, S-adenosylmethionine. The first stage of creatine biosynthesis is the transfer of the amidine group to glycine, forming L-ornithine and guanidinoacetic acid (GAA). The reaction is catalysed by the enzyme AGAT (arginine:glycine amidinotransferase), which is considered to be a factor reducing the speed of creatine synthesis, as the activity of AGAT is inhibited by the final product of the entire pathway, that is creatine. It is a perfect example of negative feedback, in which a reaction product inhibits the main enzyme of the biosynthesis pathway. Available research estimates the speed of endogenous creatine biosynthesis to be 1-2 g daily. Because the amount is insufficient, it is recommended that the demand for the substance among physically active people is covered by supplements, such as creatine monohydrate. Creatine can be found in foods such as red meat, fish, poultry. The time and temperature of thermal processing increase the breakdown of creatine to its metabolic by-products, which means that cooked meat contains less creatine than raw meat. According to research, average creatine consumption in people who eat meat is about 1 g daily. It is not a very impressive amount, so it is recommended that the demand for the substance is covered by supplements, such as creatine monohydrate. Moreover, studies comparing differences between food- and supplement-based sources of creatine have shown that creatine obtained from preparations results in a much higher peak concentration in blood plasma than in the case of creatine consumed with food. When creatine reaches its target cell, the enzyme creatine kinase binds it with a phosphate group, forming creatine phosphate. In that form, creatine can be stored in tissues. During intensive muscle work, the speed of ATP use is extremely high, which leads to the deposition of its by-products, that is ADP and inorganic phosphate (Pi). In order to prevent excessive ADP and Pi deposition and ATP exhaustion, the body uses phosphocreatine. While the body is resting after workout, phosphocreatine reserves are replenished. Its resynthesis is fast: about 95% of phosphocreatine reserves are regenerated after only 3-4 minutes. Phosphocreatine is a powerful energy system producing large amounts of ATP per unit time. However, the ability of the body to store phosphocreatine is relatively small, which means that highly intensive activity depletes its reserves very quickly (10-20 seconds). In connection, supplementation with creatine to increase phosphocreatine reserves delays tiredness, increases workout efficiency, and reduces the time needed to regenerate between exercise series. Apart from the main advantage of increased energy potential, supplementing creatine is believed to have additional benefits. By attracting water molecules to muscle cells, it increases the volume of the muscles and provides a more anabolic environment, which promotes muscle mass growth. Creatine can also improve the efficiency of exercise by reducing the time between muscle contraction and relaxation. No other supplement ingredient has been tested as thoroughly as creatine monohydrate. The efficiency and safety of use of creatine have been confirmed by a multitude of scientific studies, whose evidence was often compiled in voluminous texts describing the unbelievable benefits of using the popular supplement. In summary, Olimp Creatine Mega Caps is an effective product that can improve exercise efficiency in many sports when used properly, particularly speed and strength disciplines. The preparation is intended both for athletes and those who treat physical activity recreationally. People who limit or avoid the consumption of meat will benefit the most from using this product.